Stunning first-season flowers attract butterflies, too. Are you starting a garden? You may not know yet whether your thumbs are green or brown, but few easy garden plants can be more satisfying than dahlias for beginning gardeners. 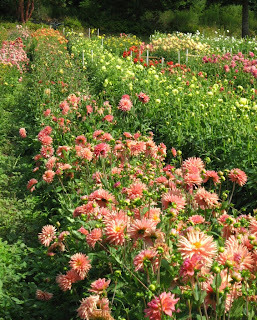 Start out with a look at some of the beautiful dahlias at Lynch Creek Farm, a major grower of dahlia bulbs or, more correctly speaking, dahlia tubers, for sale online. You'll find not only more than 200 stunning dahlia varieties to choose from, but a wealth of advice on growing dahlias. Your average perennial in a gallon pot costs $10 or more. 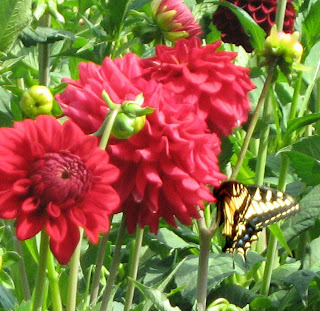 A dahlia tuber costs between $4 and $8 and will produce a three- to five-foot plant with flowers to enjoy or cut within a few months. At Lynch Creek Farm, you'll find amazing bargain dahlias that lower the cost even more: overstock dahlia tubers sell for as little as $2.75. And dahlia collections—a great way for beginners to develop a dahlia patch—offer substantial savings and you reap the benefit of choices put together by the pros at the farm. You can plant lots of varieties without breaking the bank. And consider this: at the end of your first growing season, when you dig your dahlias for storage, you will find not one tuber but from four to a dozen tubers, each with an "eye" where it will sprout next year. Dividing dahlia tubers is easy, so you'll have more dahlias to plant, or to share or trade with other gardeners. Your dahlias will multiply so you can grow lots! Dahlias create a stunning garden—fast. Your dahlias will be full-sized and beautiful their very first season. Unless you pay a fortune for big, well established perennials, you'll have to wait for a year or more for flowers when you start your garden. Dahlia tubers provide almost instant gratification: plant them this spring and you'll have an abundance of beautiful flowers in high summer. When you harvest the new tubers you'll have an abundance to plant or share in your second year. And because you plant dahlias later in the spring, you can double up with early bulbs like crocus, which won't mind if you dig close to them, or daffodils, which will have begun to dry and be ready to dig and store when it's time to plant your dahlias. Deer aren't fond of dahlias. They love roses and other garden flowers, but they'll probably leave your dahlias alone. That's an extra advantage. Dahlias are easy to grow in almost any climate and are tolerant of most types of soil. If you're just starting out as a gardener, soil testing and soil amendment are probably new to you. If you're so inclined, you can get involved with testing; if that's a bit much for you, just make sure that your soil is fertile and well drained. Dahlias do best if there is shelter from wind. 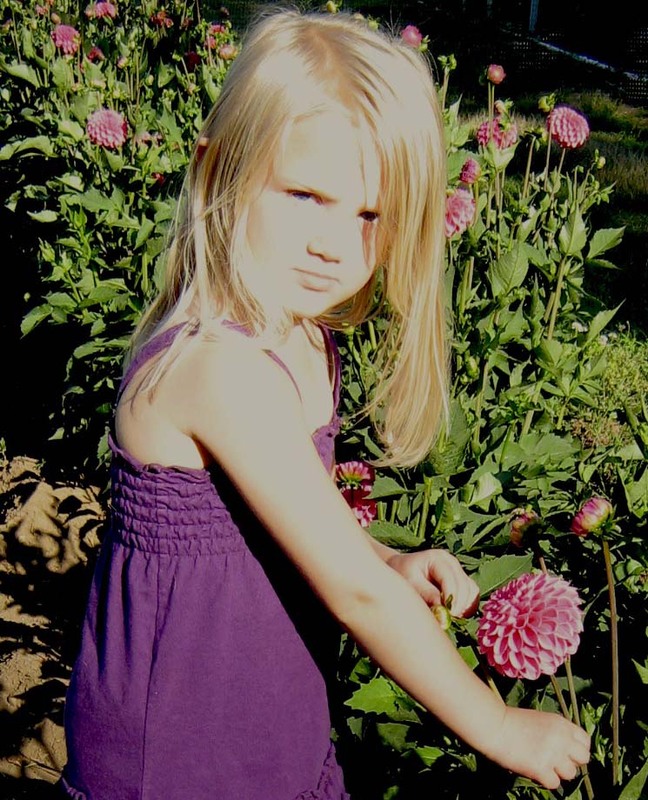 Dahlias are great first-garden plants for kids. Good drainage is important because dahlias grow from tubers, enlarged potato-like structures that store nutrients and sprout into flower-bearing plants, you don't want standing water that can encourage rot or disease. If your soil is heavy and clay-ish, dig sand and peat moss, inexpensive soil amendments, into it before you plant. In any soil, mixing in composted steer manure, compost from your compost pile if you have one, or mushroom compost will help your dahlias thrive. Plant your dahlia tubers after all danger of frost is past. Dig a hole about six inches deep in your prepared soil, lay the tuber in place horizontally with the eye up, and drive a stake in close to the tuber before you cover it. Keep the area weed-free; once your dahlias are up and thriving, they'll shade out the competition. If they appear to need support, tie them to the stake with a one-inch strip of cloth. Water sparingly. If you suspect the presence of slugs, use an organic slug bait or protect your dahlias with copper barriers. Slugs are probably the number-one dahlia pest, since they're voracious feeders and love those tender dahlia shoots emerging at ground level. Snails are a similar menace. That's it. 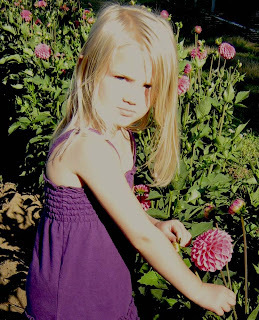 So check out all the dahlia tubers for sale at Lynch Creek Farm today, and get growing!